Stress Francis and Laverde equal parts. Hope I’m doing this correctly. Dumb question amnesty invoked - why just not choose players you know are going to be selected and are durable? Because you’ll get a low return. The calculated risk takers usually win this game in the long run. 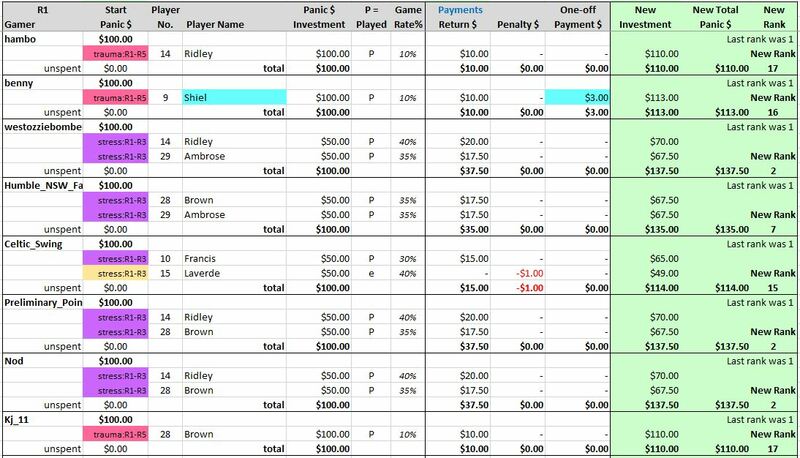 You get a bigger payment by choosing players who are more risky. And the winner is the Gamer who has most money at the end. But there are a number of different strategies you can use. Why don’t you play and try a few and see what happens. Bitchboys with their stress. Only a real man played in the 80s trauma. How does the bonus on trauma work. I see it goes up to $6k. What does your player need to do to get that? Wait 5 weeks. 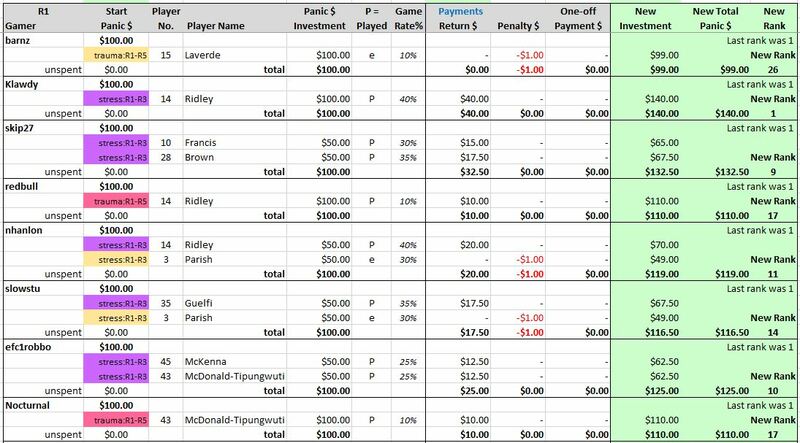 That is the Trauma bonus offered if you lock in at R5 for 5 weeks so you get paid $6k after R9 if your player plays all those games (R5 to R9). All the bonuses start small in R1 and get bigger every round all through the season - so don’t get too distracted by that. This game is frustrating & so so heartbreaking…so I guess I’m back for more pain this year! Squad of 26 is named. The following table shows all the 26 players ranked from highest possible return. So far all Gamers are still alive, nobody missed with their selection yet - although with 4 players still to be cut it is likely some Gamers will miss out. Investors in Laverde, Guelfi, Parish and Francis would have to be most worried, particularly those who locked in their players. The table below shows where the Gamers would be ranked if all 26 players in the squad did play, just to give you some idea of where you might end up. The table includes the WIn Jackpot (of course we will win), but there are no best player bonuses yet. Sorry, must have scrolled passed it for some reason. I’ll add you in. Anybody else think they were missed or misinterpreted? Wait until I see the final team and I’ll let you know. Yeah the coaches missed Lav, easy mistake to make. So, who is confident that their players are going to get games through to the end of their locks? Blitz : Drop them all. Coaches : No changes for mine. 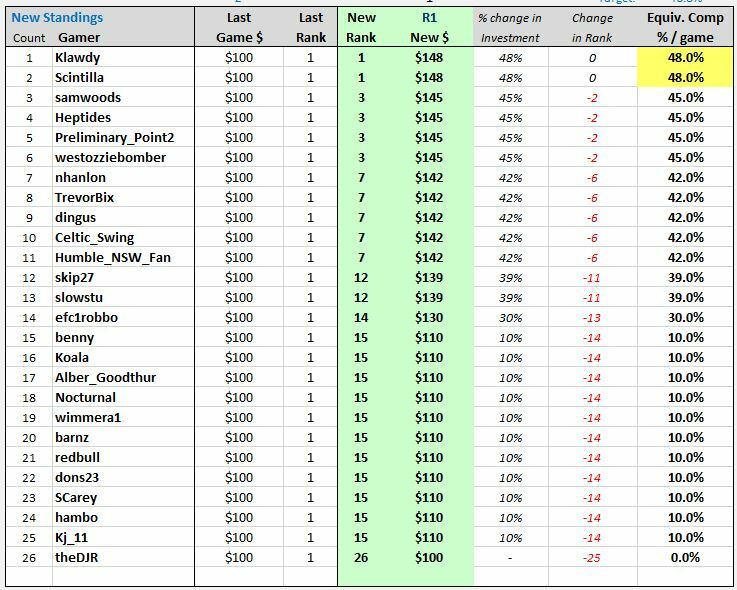 Here are new standings after R1 debacle v Gooder Weather Specialists. No Win Jackpot, but at least there is not a rubbish penalty. The AFL website has named only 3 least worst players - Zaharakis, Heppell and Shiel. 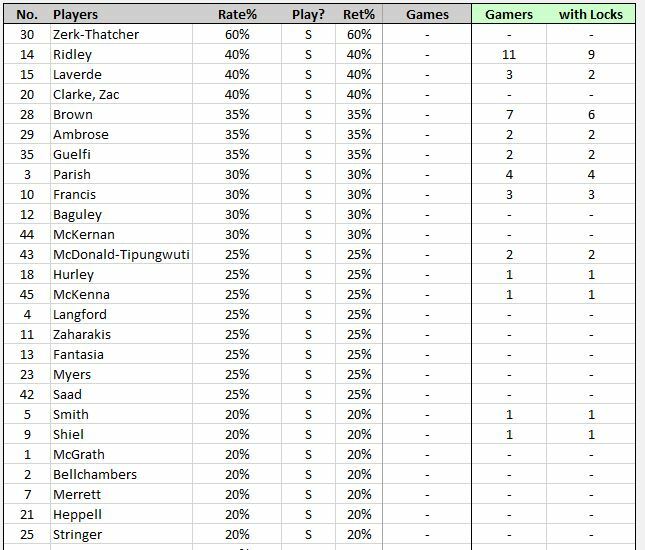 Of those only Shiel has been selected, and by only one Gamer (@benny who gets $3). Click on any pic and it should open up a slideshow that you can click through all the tables. EDIT: Our bye is R12 this year, I will fix up the comment in the legend next round. 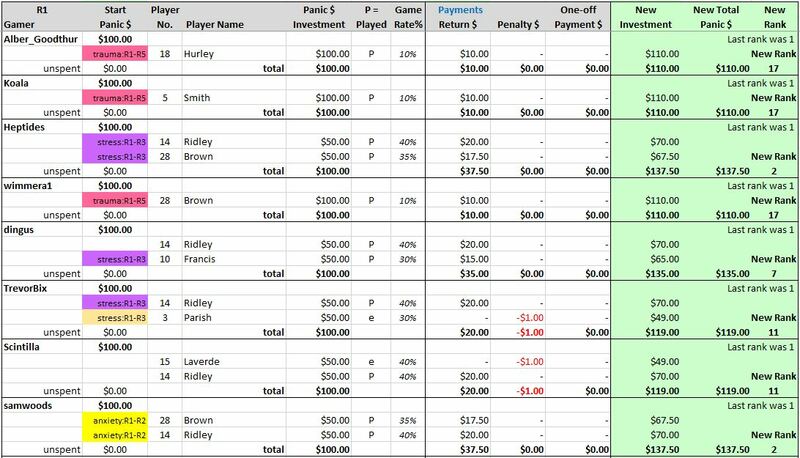 Find your name and check out the calculations for your players. If you don’t agree with or don’t understand the calculations please ask. Your rank after round 1 is shown in the lower right hand corner of your line.